Another year, another hint by Garrison Keillor that he may be leaning towards giving up "A Prairie Home Companion." In an interview with the Charleston City Paper published Wednesday, a reporter asked him if he was thinking about leaving Lake Wobegon. "Certainly. Any day now," the 71-year-old radio host replied. "It'll dawn on me that I've said all I can say and I will say, 'Thank you,' and walk away." Keiloor also told the reporter that he would consider moving to New York City. "I have a little apartment there and my wife and I fly out and occupy it on occasion," he said. "It's our version of a lake cabin, a pied-a-terre on the Upper West Side of Manhattan, not far from Central Park, fifteen minutes from Broadway. A great city for walking." 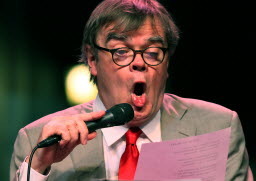 Of course, Keillor has left the show before and spoken of retirement several times in recent years without any concrete signs that he would actually leave the show he started 41 years ago. However, Keillor recently handed over hosting duties for two weeks. Keillor's interview with the Charleston City Paper is connected to an appearance he's making in the city Wednesday night. In an e-mail to the Star Tribune Wednesday afternoon, Keillor said he was unaware of what the reporter printed. "Anyway, we're planning next season and that's as far ahead as we've ever planned," he wrote. "So onward we go." Are the Rolling Stones headed to Minnesota this summer?